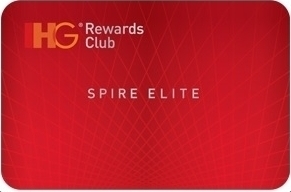 How I obtained the new IHG Rewards Club Spire Elite status without doing any stays! In my article on Friday I showed how difficult it will be to earn the new top tier status in IHG Rewards Club. Unless you spend £37,500 in a calendar year on the IHG Rewards Club Premium Visa or book a lot of stays which come with a bonus points package, you will need to spend $7,500 before VAT at InterContinental, Holiday Inn, Crowne Plaza etc hotels in a year to earn the 75,000 base points required. Unless you’re me, of course. I have found the one roundabout route left to earn those key 75,000 base points. By making transfers to IHG from Virgin Atlantic Flying Club. This page on the Virgin Atlantic website explains how to do it. Before you say ‘that is a terrible idea’ and close the page, let me explain why. I have, in the past, said that transferring Virgin miles to IHG was a bad idea. Why have I changed my mind? The trigger is this: you receive 25,000 bonus IHG Rewards Club points when you reach or renew the new IHG Spire Elite top tier. These points post instantly to your account – I have already claimed mine as you can see from the screenshot. There is an alternative of gifting Platinum status to a friend but I have discounted that in this analysis. I value IHG Rewards Club points at 0.5p, based on redeeming 50,000 for a five-star InterContinental night valued at £250 in a major city. These are ALL acceptable valuations for a Virgin Flying Club redemption, in my opinion, and the last one is almost generous. However, you ALSO need to factor in the 100% points bonus that you will receive on your IHG stays whilst you have top tier status AND whatever upgrades and benefits the new tier will bring. That will add extra value on top. Imagine that you have no Virgin miles at the moment but obtain them by transferring in from American Express Membership Rewards points at 1:1. You would get the same valuations – 0.71p per Amex point if you transferred 60,000 up to a whopping 1.12p per Amex point for transferring 20,000. Again, this assumes ZERO value for the 100% base points bonus you will get as a top tier member or the value of upgrades etc. If we ever see another American Express Membership Rewards to Virgin Flying Club transfer bonus of 20%-25%, these numbers look even better. Here is another example. Imagine that you convert Tesco Clubcard points to Virgin Flying Club to IHG Rewards Club. Again, not bad. And, again, it ignore any benefits you get from Spire Elite. Timing is an issue …. If you are thinking of doing this, there is a timing issue to consider. If you need to do a big conversion, perhaps you are better forgetting about your current small number of elite points and waiting until January 2016? You would then get status until December 2017. Secondly, you will obviously earn more elite points from your future stays in 2016. If you are only 20,000 points short and know you will earn those 20,000 before New Year, you need to decide whether the value of Spire on your remaining 2015 stays makes it worthwhile blowing miles. You CANNOT factor in the 25,000 point bonus in this calculation, because if you will hit Spire anyway then you are getting that regardless. PS. Because the new top tier IHG status will be hard to earn, it should have more value at a status match. You may have an easier time getting matched to the top tier in other hotel chains. There is additional value in that. PPS. Remember that there is no reason why IHG will keep these transfers as status earning in the long term. For now, though, it works. Well I have pressed the button on this with 10000 orphaned VS miles. As a result will get this new status thanks to the 60,000 sign up bonus earlier this year counting on this occasion towards status. For me I have 10 nights in an Intercon beach resort coming up and a further 4 nights in a HI so having this status just prior to arrival should be useful.. I also plan to convert my 25k bonus to IC ambassador status and this may help with the IC stay…which is on points…….so never guaranteed…but it helps and there is a free weekend night certificate to take into account also….so not a bad conversion in my view for the first year at least. I only need 3,300 points so should receive this within the next month or 2 from the VISA spend. I only use it for places that do not accept AMEX. I have a stay at Crowne Plaza in Sept, want to get upgraded before I go just to see what, if anything, they offer in practice. I also want an upgrade before Sept, but it is not a far off as it sounds taking into account statement dates and transfer times. I am moving all my spending to IHG now to make sure, plus e-Rewards if I can find some surveys that work! Having bought points in the ING sale at 0.00575c per point a couple of weeks back – paying the extra 7000 points needed on top of the 25000 bonus Spire points to buy Ambassador status – this would get me a free weekend night wouldn’t it? So an IC night for 32000 points? I should hit Spire next month. No forget that. Terrible at maths. Hi my husband has 61k points so wanted to top up his account for spire elite but the mr points are in my account does anyone know if I can transfer these to a VA account, neither of us have a VA account at present but we could open one if there was a way of doing this it would be great? Noticed this on Monday , I’d transferred 10k in from Virgin Atlantic, I only had 858 points and instantly went to Gold Elite. Rob, FYI I transferred 15K Virgin miles by phone to my IHG account early this Monday morning to hit the 75,000 Spire (Spire Ambassador) requirement and it’s already upgraded, so just 3 days. Many thanks for the heads up on this one, much appreciated! Made the transfer from Amex to VA on Tuesday, and from VA to IHG on the same day. They’ve already credited and Spire status attained. This was one of your very best tips, thanks Raffles! Likewise. Transferred a small amount from VFC to IHG on the 14th July and they have already credited and status updated to Spire. Thank you sharing this Raffles, and well done VFC for doing the transfer so quickly. You also get a new ambassador voucher, I was amazed when I got upgraded to platinum ambassador and got another few night voucher in the same year valid until next July! Would be good to reach Spire before Feb 2016 in my case.